This 6 days Uganda chimpanzee and wildlife safari, sees you Kibale forest national park for chimpanzee trekking and nature walk, later proceed to queen Elizabeth national park for a wildlife experience and boat cruise on the Kazinga channel the worlds biggest concentration of hippos.Depart queen Elizabeth national park for another wildlife experience at lake Mburo national park home to a huge number of zebras. later departing mburo and transferring to Entebbe for a scheduled flight back home. Day 1: Pick from hotel in Entebbe and transfer to Kibale national park. In morning after your breakfast, your safari guide will pick you from Protea hotel Entebbe and give you briefs about your safari. You will later embark on drive to Kibale forest national park in Fort portal Kabarole District. As you glide, through Uganda’s lush countryside transcending the districts of MItyana, Mubende and kyenjojo, you will surely keep getting sight of new features on your way, some which include the plantation, hills and homestead and many more. The drive takes approximately 5 hours with a lunch stop at Fort portal town. Upon arrival to the park area, you will check at Kyaninga lodge. Dinner and overnight stay at the lodge. Day 2: Chimpanzee trekking and nature walk. Early in the morning after breakfast, you will depart your lodge and head to the park headquarters/briefing point; you will be briefed about chimpanzee trekking. Be assigned rangers to take you through the tracking. Enter the forest in search for the chimpanzees as you move in the jungles, you may encounter other primates such as the greycheeked mangabey , l ‘hoest monkeys, red tail monkey, colobus monkeys and several other forest bird species. As you transcend the jungles, you will notice sounds of the chimpanzees, upon meeting them, you will have a maximum of 1 hour interacting and taking photos with. Later head back to the lodge for lunch and relaxation. Later in the afternoon, you will do a nature walk around the lodge to view the beautiful crater lakes and goat farm to see how they make goat milk products such as cheese. Dinner and an overnight stay at the lodge. Day 3: Transfer to Queen Elizabeth national park and do and afternoon boat cruise. In the morning after breakfast, you will check out of the lodge and embark on a scenic drive to queen Elizabeth national park. Upon arrival, you will check in at Mweya safari lodge on the Mweya peninsula, Lunch and brief relaxation at the lodge. Later in the afternoon head for a scenic boat cruise on Kazinga channel, viewing the largest concentration of hippos up-close, you will also view other wildlife such as the buffaloes, elephants, kobs and several bird species ashore. Later depart boat and head back to the lodge. Dinner and overnight stay at Mweya safari lodge. Day 4: Morning game drive tracking lions and an afternoon crater drive. Early in the morning after breakfast, you will embark on a morning game drive in search for the wildlife in the savanna; you will be in position to view the Uganda kobs, buffaloes, elephants, warthogs. 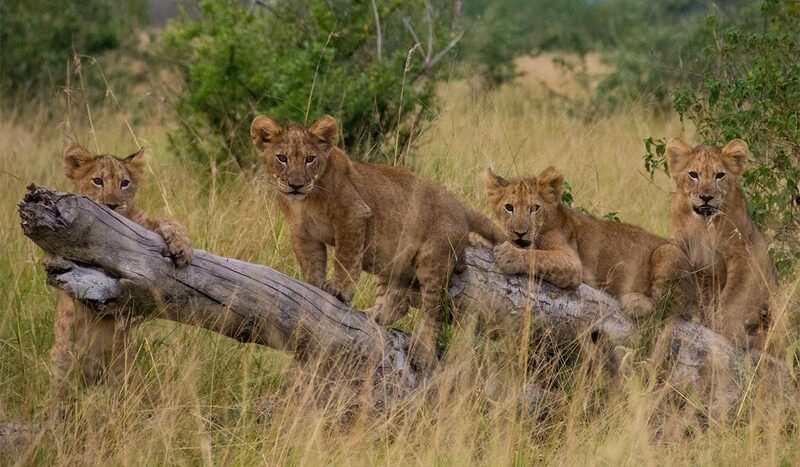 A special attention will be more on tracking the lions in the savanna. Later withdraw from the game drive and transfer back to the lodge for lunch. After lunch, board the vehicle and head for an afternoon crater drive. You will be position to see the amazing features such as the deep craters filled with water. Later depart the crater and transfer back to the lodge for dinner and an overnight stay. Day 5: Transfer to Lake Mburo national park do night game drive. In the morning have breakfast, check out of Mweya safari lodge and transfer to Lake Mburo National park, in a 4 to 5 hours’ drive. Arrive at Lake Mburo national park , check in at Mihingo lodge, have lunch and relax ie you can go swimming. As it clocks 6:45pm, you will jump in the vehicle again to head for a night game drive. The night game drive could land you a golden opportunity of seeing the parks rarest inhabitant the elusive leopard. You will also see other wildlife such as the giraffes, buffaloes, hippos, zebras, elands, water bucks etc. later after the night game drive, and head back to the lodge have dinner and an overnight stay. Day 6: Morning game drive and transfer to Entebbe for your flight back home. Have an early morning breakfast, and head to the park for a morning game drive, the game drive guarantees you an opportunity to view what you couldn’t have seen during the night game drive. You will see the zebras the parks commonest residents, elands, water bucks, antelopes, warthogs etc. Depart the game drive and head back to the lodge. Check out of the lodge and transfer to Entebbe for your flight back home.